Lovely home located on South Haven's north side. Close to the beach. Close to town at 224 North St.
Weekly Rentals Begin or End on Sunday. No Pets Permitted but Owner Has a Dog. 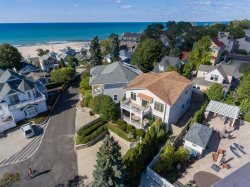 Located in a peaceful, lush neighborhood on South Haven's north side and close to all that charming South Haven has to offer - Connie's Beach Paradise is truly a home away from home! Lake Michigan's North Beach is a mere two block stroll away. No searching for a parking space! Enjoy the symphony of birds on the spacious deck that overlooks the ravine. Fire up the full-size gas grill for an outdoor feast - what a serene location for casual entertaining. The open-concept kitchen and dining area with vaulted ceilings is the perfect place to gather with family and friends. The adjoining living area is bright, inviting, and comfy - a great place to socialize, curl up with a book, or simply watch TV. A short walk around the corner, you will find Stanley Johnston Park atop the hill overlooking the Black River, where a host of events are held, including the Annual South Haven Art Fair. Located a block away is the famous Dyckman Drawbridge and the city awaits on the other side! Just over the bridge and up the hill, stop at Admiral Jacks (a floating restaurant on the Black River!) for fried perch and a cocktail, and watch the many watercraft taxi by. If you are looking for a tranquil setting in reach of all of South Haven's beautiful attractions and conveniences, Connie's Beach Paradise is the place for you. Great! They were flexible with our dates and even called the renter before to ensure the house would be ready on our arrival date. My experience working with the members of Shores Vacation Rentals was thoroughly enjoyable. From property reservations to guest services, they were helpful, prompt, professional & friendly. We enjoyed our vacation at Connies Place. It was relaxing and located in a perfect spot from both the beach & the town. Perfect location 2 blocks from beach, 2 blocks from Stanley Johnston Park (went to craft fair) and 2 blocks from South Haven Bridge. Near everything but felt out of the congestion on a quite street with a wooded back. Decorated very cute and every amenity you will need. Nice for a group with older couple with the 1st floor bedroom. Wonderful cozy home! We have used your services for years and return every year. We usually rent a condo. This was the first time renting this beautiful CLEAN house. We are looking forward to next year. Really like the place we stayed at. Meet almost all of our needs. Thank you for another terrific summer vacation in South Haven!